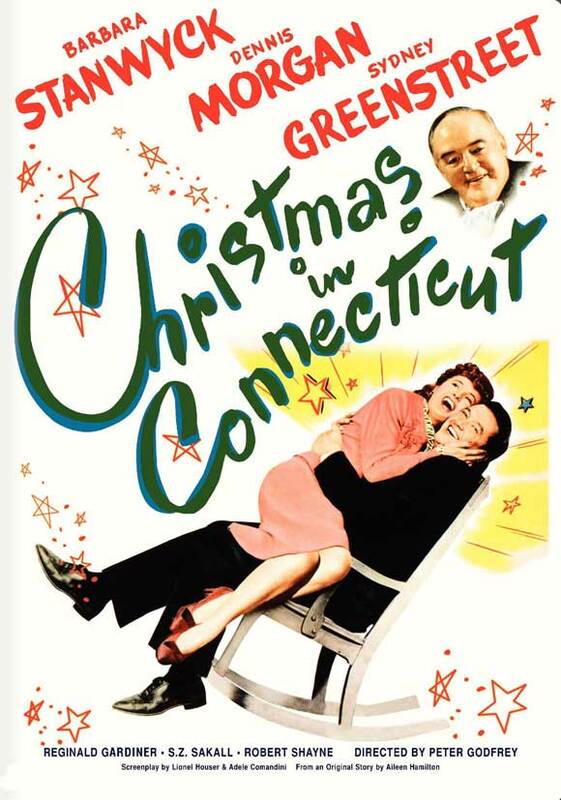 A Follow Spot: My Favorite Holiday Movies: "Christmas in Connecticut"
My Favorite Holiday Movies: "Christmas in Connecticut"
One of my favorites for the holidays, "Holiday Inn," showed up at the Normal Theater and on TV (AMC channel) last weekend. Now it's time for another of my favorites, the charming "Christmas in Connecticut," which hits AMC on Sunday and Monday. "Christmas in Connecticut" is a lesser-known holiday gem than "Holiday Inn," but it went over well enough to spawn a remake. Still, it's the 1945 version, starring Barbara Stanwyck and Dennis Morgan, that deserves your attention. The 1992 TV movie, with Dyan Cannon and Kris Kristofferson? Just don't go there. But let's not talk about that one. Let's go back to the '45 original, with a screenplay by Lionel Houser and Adele Comandini, based on a story by Aileen Hamilton. Its wartime setting informs the plot, about a magazine writer named Elizabeth Lane, played by Barbara Stanwyck, who is a bit of a know-it-all on paper. She writes about cooking and homemaking and all sorts of warm, fuzzy things. She's sort of the Martha Stewart of her time, with the addition of a made-up husband and a baby and cozy house in Connecticut. Emphasis on the "made-up" part. Our girl Elizabeth is a single city girl who can't even boil water. But then a heroic GI, one Jefferson Jones, played by the very handsome Dennis Morgan, decides that all he wants for Christmas is to spend his holiday leave with a real family like Elizabeth's. Except, of course, it isn't real. This being the movies, Elizabeth can't possibly out herself as a fake, so she and her friends, including a chef played by the adorable S. Z. "Cuddles" Sakall, scramble to put together the elements -- home, husband, baby, delicious holiday feast -- to keep her image alive. I love this movie. I used it as a starting point for one of my own books, "Fantasy Wife," where the Martha Stewart-like character (definitely fake, definitely know-it-ally) is not the heroine. Instead, it's her assistant, who has really been writing all her boss's how-to books, who gets involved with the guy, a busy executive who thinks a know-it-all is the solution to his childcare woes. Obviously, I took the idea (fake home-making expert) in a very different direction, and I didn't involve Christmas or a war hero, but my inspiration was my love for "Christmas in Connecticut." One of the best things about the movie is the supporting cast, like Cuddles Sakall, with Sydney Greenstreet as Elizabeth's pushy publisher, Reginald Gardner as her unctuous faux-husband, and Una O'Connor as a helpful housekeeper. Barbara Stanwyck is warm and delightful, she has good chemistry with Dennis Morgan (who looks great in a uniform and gets to sing a little, too) and the movie works like a holiday charm. "Christmas in Connecticut" gets 4 stars from me. Look for it on American Movie Classics on Sunday, December 19, at 9:15 am (right after another showing of "Holiday Inn") or 11:30 pm, or on Monday, December 20, at 2:15 pm. All times listed are Central Standard Time. I caught this once on TV (very likely on AMC years ago), and enjoyed it too. Barbara Stanwyck is one of those stars of yesteryear who, though remembered, is in danger of being remembered in too narrow a niche. Because of her late work for TV, particularly The Big Valley and The Colbys, plus her best-remembered movie role in Double Indemnity, people think of her as this tough no-nonsense dame (with a later overlay of matriarch). But she could do about anything, short of musicals (and she even impersonated a showgirl offstage wonderfully, in Ball of Fire). She had plenty of warmth as here, could be lively and funny and lovable, and always seemed natural and unaffected. This is a great movie to see her in. I think you know how I feel about "Ball of Fire," so no argument from me on that one. Love it, too. It doesn't get aired on TV enough, either. At least "Christmas in Connecticut" has that Christmas connection to keep it revived. I do think "Ball of Fire" is on Netflix, though. And you're right about Ms. Stanwyck. If today's movie fans know her, it's from the femme fatale or matriarch roles, when she was one of the best screwball comedy actresses around, right up there with Jean Arthur and Claudette Colbert, with Arthur's warmth and Colbert's intelligence and a whole snappy, sassy thing of her own. I saw this once but so long ago I can hardly remember anything except liking it. You know, I think I've never seen "Holiday." I guess it's time, huh? Except December 28 is my travel day back home. Oh well, it's hardly impossible to find in other ways; I'll make a point of it. Frankly, I'm shocked, Jon. How can you have missed "Holiday" all these years?